Lots of people were looking forward to the remake of Fox’s “In Living Color”, and I was one of them. I felt a kinship with the rebirth of the show because I was a tiny bit helpful in scheduling some of the auditions. LA producer Shauna Garr was working directly with Keenen Ivory Wayans the creator of the original show, who was very particular in the type of talent he was looking for. People who do characters, and especially a multitude of characters are few and far between. 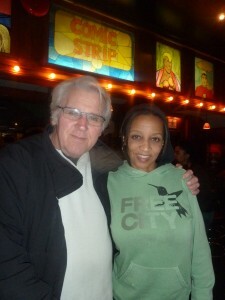 L.A. Producer Shauna Garr with Richie Tienken owner/founder of The Comic Strip at the auditions I helped arrange! That’s why I think Nick Kroll is so amazing, because he does so many characters and does them so well, as is evidenced on his new show on Comedy Central, which debuted on Wed. 1/16/13 simply called “Kroll Show”! 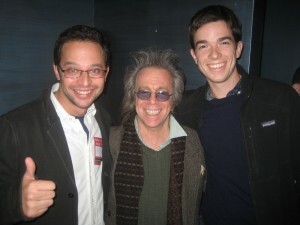 Jeffrey Gurian of Comedy Matters TV with Nick Kroll (L) and his writing partner John Mulaney from SNL at a comedy event in NYC! I had two talented friends on the planned re-make. One was Jermaine Fowler who I got to know at The Comic Strip, and from some shows we did together, and the other was my longtime friend Kali Hawk, who has done amazing things out in Hollywood in both film and TV. I know her since she was just starting out in NYC, and I’m really proud of all her hard-won accomplishments. 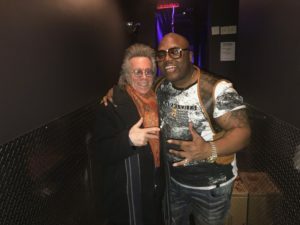 Jeffrey Gurian from Comedy Matters TV and the spectacular Kali Hawk in LA at a party for Jeffrey’s book “Filthy, Funny, and Totally Offensive!” And if you look closely I think I’m wearing her necklace, cause it sure isn’t MINE!!! 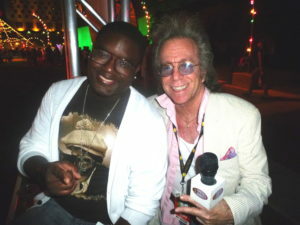 This past summer up in Montreal at the Just for Laughs Festival, the biggest comedy festival in the world, I was chosen as the official celeb interviewer, and did 40 interviews, including one with Jermaine Fowler and one with L’il Rel who was also cast for the show! I’ve had a lot of last minute major disappointments in my life, where things that were supposed to happen didn’t happen, so I can only imagine how the cast members felt to learn their big break was not going to be on this show. Will Harris wrote in the NY Post that Keenen Ivory Wayans said, ” The bar for “In Living Color” is so high that, if I didn’t feel like we could sustain that, then I did not want to move forward.” I totally get that. Because when you remake a hit show, people expect it to be exponentially better and with the cast that came out of the original show, like Jim Carrey and Jamie Foxx, that would be some formidable task. So all that work, and all that casting and travel and auditioning, and tension and stress was for nothing! Not really though, because everything you do in this business is HUGE. Most people will never even get the chance to be cast on a show, so the people that were should still feel very special! 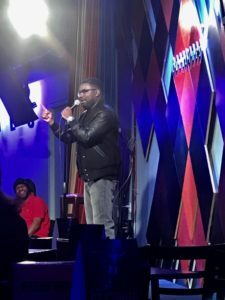 I had fun helping Shauna and Keenen with the casting, by setting up some auditions at The Comic Strip and by sending a couple of people down to The Laugh Lounge, including a young, talented comic named Tyler Fisher who I think is gonna be very big! 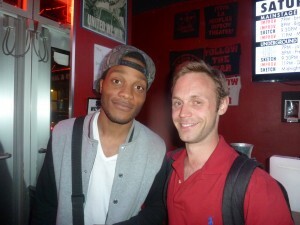 Two comedy talents headed for stardom, Jermaine Fowler and Tyler Fischer! I also got to be great friends with Chaunte Wayans, the daughter of one of the Wayans sisters, who’s a really funny comic as well based out of Atlanta! Watch out for her too! 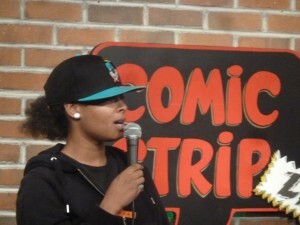 Chaunte Wayans killin’ it onstage at The Comic Strip! And on that note I’m out! Aries Spears’ website identifies him as “The Funniest Muther-F#*ker On The Planet” and I don’t think I’d argue with that. Most people tend to hype themselves, but in Aries’ case it’s true. I can see why he was a star on Mad TV. His characters, and ability to do dialects, are amazing. 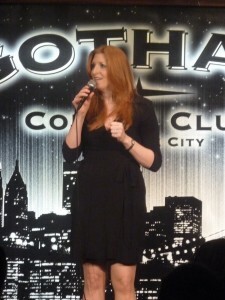 And Gotham Comedy Club was packed to capacity, which not all comics can do. To give you an idea of how crowded it was, they had to put two strangers at my table, cause they were totally out of space! And I was cool with that! They happened to be nice people! 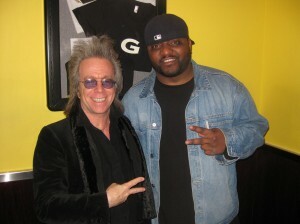 Jeffrey Gurian from Comedy Matters TV with L.A. comic Aries Spears at Gotham Comedy Club! Jimmy Failla was the MC and opened with a strong set. Opening a show the right way is so important. It gets the crowd in the mood to laugh. Jimmy just has that way about him, and coupled with strong material makes for a good host. 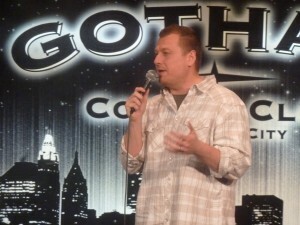 Jimmy Failla onstage at Gotham getting the audience in a good mood! I always knew that hosting was difficult, but when I started doing it myself at The Comic Strip, I REALLY appreciated how much harder it is than just doing a regular spot. A few nights later, Jimmy and I got to perform together at Gotham on Alyse Kenny’s comedy show for the charity, “The Cure Is Now”! Alyse produces a once a month show at Gotham in the Vintage Lounge, each month benefitting a different charity. Veronica Mosey doing her comedy thing at Aries Spears’ show at Gotham! Areis did at least an hour seamlessly. Never at a loss for what to do next. He jokes about Blacks and Whites equally, and does an incredible imitation of a “White” voice! He says he uses that voice when he’s talking to a white girl, so that he feels white. As he tells that story he plays the classic Rick Springfield rock song in the background, ” Jessie’s Girl”. Aries says, you know you’re a big star when you can sell out Africa! He says that Maury Povich’s show is “Black ignorance at it’s finest!”, which may be the best summation I ever heard. 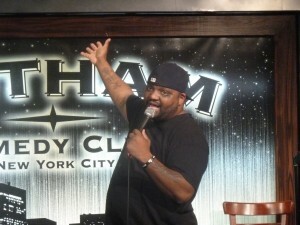 The multi-talented Aries Spears making a point during his sold-out show at Gotham Comedy Club! And then as a finale he does a rap song while imitating all the rappers like Snoop, DMX, Method Man, Biggie and Jay-Z. The man is an entertainment phenomenon, and if you get a chance to see him go for it! 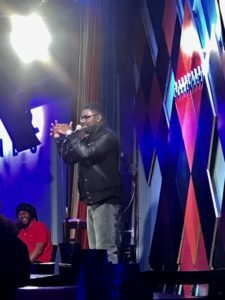 Anthony Anderson’s third anniversary of his Mixtape Comedy Show was as good as I expected it to be. 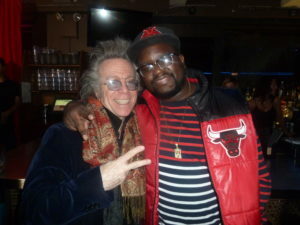 I just couldn’t believe it’s been 3 years already since he and his partner in crime Royale Watkins have been bringing the funny to Gotham Comedy Club, the third Sunday of each and every month. 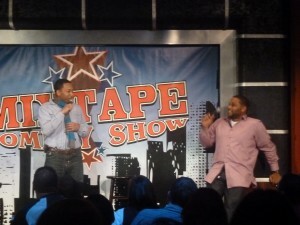 Royale Watkins and Anthony Anderson bantering with each other onstage at the Mixtape Comedy Show at Gotham in NYC! The show mixes comedy and hip-hop, most of the time with a great DJ, DJ Diamond, who really gets the crowd pumped up! Then there’s a freestyle rap battle which still amazes me how these street MC’s can spit beats on the spot like that. It’s such an incredible talent. Even the ones who lose are admirable just for being able to do it at all. I was glad to see that Royale is just as amazed by it as I am, which he says in the video below. 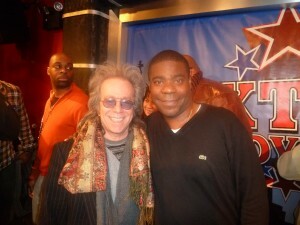 Jeffrey Gurian of Comedy Matters TV with Tracy Morgan at a previous Mixtape Comedy Show! You never know in advance who’s gonna be on the show, but it doesn’t matter cause I haven’t seen a weak show yet! The idea is that if you’re coming to see Mixtape Comedy, it doesn’t matter who’s advertised, because you’re coming for the brand. And the brand is hot!!! Plus you never know who’s gonna stop by to do a surprise guest spot. 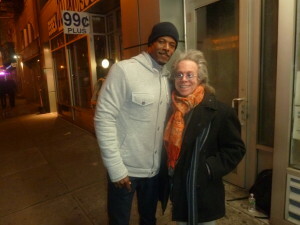 Tracy Morgan is a big fan of the show, and I’ve seen him perform, but this night he just came to watch! It’s produced by Kristen J. Eddy and Byron Ward and the show is U-Streamed to people all over the United States, and internationally too! They don’t allow profanity which is a nice change. Some of the comics are taken by surprise by that rule. Kurt Metzger told me he was a little nervous that something inappropriate might slip out since he’s not used to working squeaky clean. Fortunately it didn’t and he killed it as he always does. Because I knew it would be a special show, I came prepared to shoot a little video for Comedy Matters TV. Harris Stanton was the first comic to perform. Harris was also a good friend of Patrice Oneal, who we unfortunately lost very recently, at only 41 years old, due to an untimely stroke. 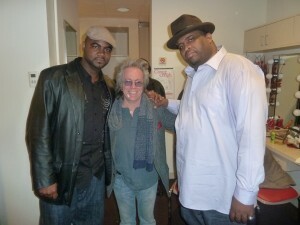 Harris Stanton, Jeffrey Gurian of Comedy Matters TV, and Patrice Oneal at the taping of Patrice’s last special for Comedy Central at The Skirball Center in NYC! Harris is very funny and talks about having been a security guard, with nothing to protect himself but a piece of paper. Then he goes into what I would call “papercut” material, which I thought was very funny, and very true. You can get a nasty cut from a piece of paper, but if a guy had a knife, I wouldn’t want to have to defend myself with a piece of paper! 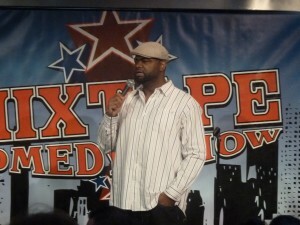 Harris Stanton doing his thing onstage at Mixtape Comedy Show at Gotham! 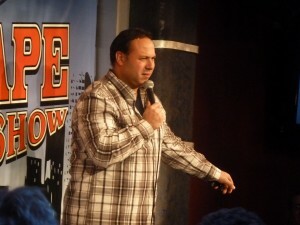 Mark Viera showing the Mixtape audience why he deserves his own show on Fox! Sherri Shepherd from “The View” was next and left the audience weak from laughing so hard. 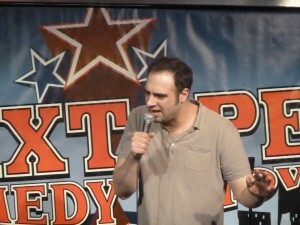 Rising star Kurt Metzger onstage at Gotham for the 3rd anniversary of the Mixtape Comedy Show! Then Kurt Metzger, who I think is hysterical talked about how every young Black person shot accidentally by stray bullets, is usually on their way to greatness before they were prematurely cut down. His advice is ” If you’re Black and have a scholarship of some kind, my advice is to buy a bulletproof vest. Gangs always shoot at other gangs and miss, killing some Black nerd who was on his way to a life of success.” Sad but true! You read it every day! 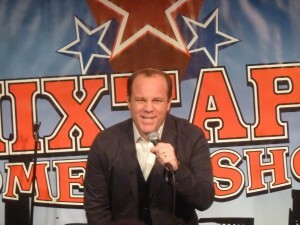 Tom Papa, host of The Marriage Ref on NBC, onstage for the Mixtape Comedy Show 3rd anniversary! And then Tom Papa took the stage with his own particular brand of humor that is so relatable, and on the money, every word out of his mouth brought huge laughs from the audience. His comedy speaks to everyone, like when he marvels at children, ” Your hands are so little”, and wonders why they need pockets in their clothing. “What are you gonna put in there, … your marble??? Check out Tom in the video below as well. We wish Anthony and Royale, ( and Kristen, and Byron of course! 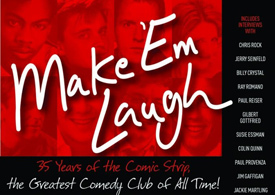 ), many more years of success with Mixtape Comedy Show!